The chapter has been created collaborately by Friederike Richter and Beeke Stegmann. Medieval manuscripts often contain some degree of illumination as e.g. 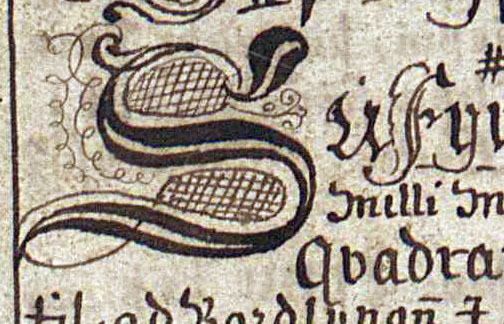 marginal drawings or initials. Encoding and systematic recording of the occurring illuminations enables the XML data to become a highly useful tool for scholars working from many different angles. For instance, studies in material philology and art history will highly benefit from it, because it enables scholars to search for and, thus, easily find relevant instances. What is more, the careful encoding of initials and their decoration will provide deeper insight into the indented hierarchy, structure and layout of manuscripts. 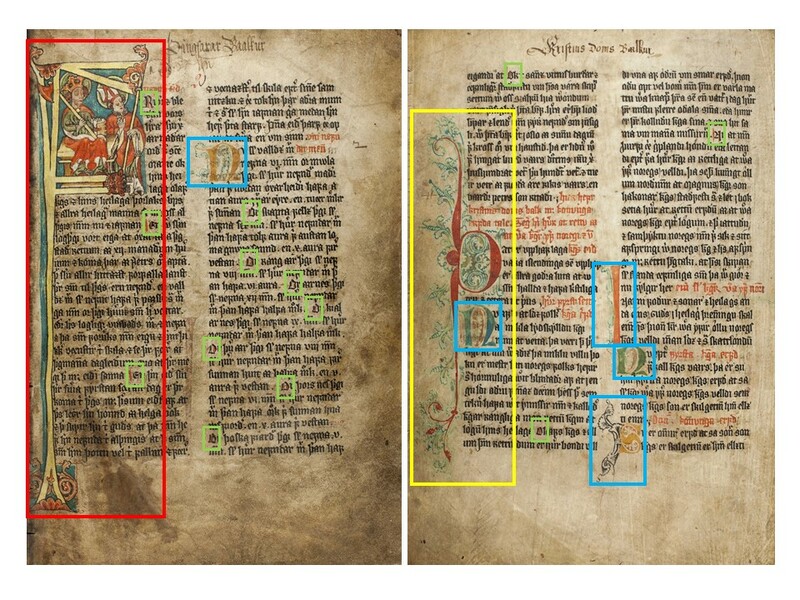 In fact, one of the major advantages of including descriptions of these visual elements into digital transcriptions is the direct linking to the manuscript’s text. 2. in the body as part of the transcription (see 7.3 below). While the manuscript description in the header should include a register of all illuminations including the initials (see also ch. 14.3), in the transcription only initials are encoded, as they are part of the wording of the text. The register of illuminations in the header is mainly a description in prose and can even be rather elaborate (if desired and appropriate). By contrast, the encoding in the transcription is more basic and covers only a few central characteristics that are specified by means of attributes, which makes them highly searcheable. - Type and occurrence of illumination (for initials ch. 7.2.1.1, for other illuminations ch. 7.2.2.1). - Description of the motif or decoration (for initials ch. 7.2.1.2, for other illuminations ch. 7.2.2.2; for optional further detail see ch. 7.2.6 on illumination techniques and ch. 7.2.7 on motifs and composition). - Inks and colours used (ch. 7.2.3). - Hands and dating (ch. 7.2.5). - The letter and its form (ch. 7.3.1). - Hierarchy of initials (ch. 7.3.2). - Initial size (ch. 7.3.3). - Colours used (ch. 7.3.4). - Artistic rendition (ch. 7.3.5). Note also the glossary in the end of the chapter that helps, among others, to identify and name the different parts of an initial (see 7.4). Furthermore, we refer to the introduction to manuscript illumination by Michelle Brown (1994), which is available in an updated version in the Glossaries of the British Library, as well as to Christine Jakobi-Mirwald (2008). 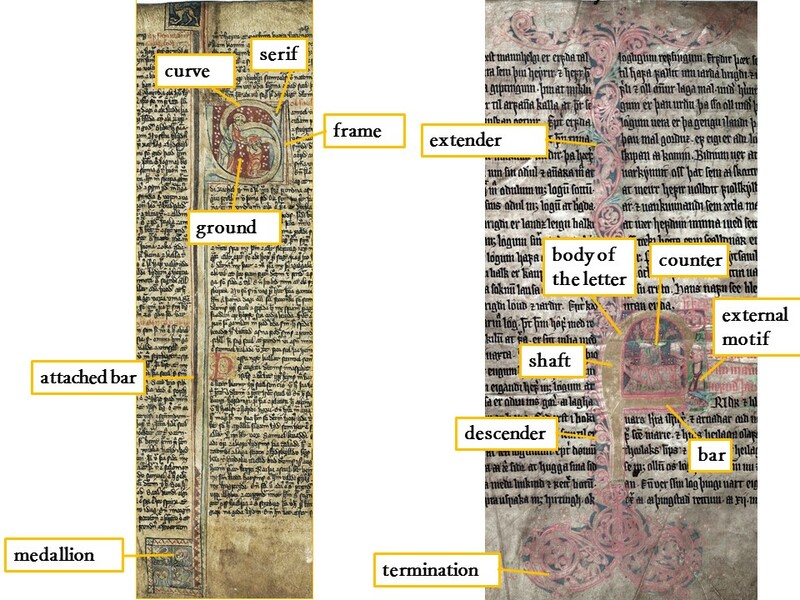 Both works were used to prepare this chapter, while some definitions were adapted for the corpus of Scandinavian manuscripts. All illuminations should be listed within the element <decoDesc> in the manuscript description section of the header (see also ch. 14.3.3). A separate <decoNote> is used for each illumination – including the major initials. The register should be chronological, i.e. following the order of occurrence in the manuscript. Full-page illumination, Christ on the cross. Colours: yellow, blue, light red. Historiated opening initial M depicting king Magnús, 12 l.
Colours: light red, blue, green, yellow. foliate chapter initials, 2-3 l.
Each <decoNote> -entry starts with the indication of the folio (and if applicable the column) of the respective illumination, which is encoded in a <locus> element. Second, each <decoNote> should indicate the illumination type in question, e.g. full-page illumination or opening initial. These would than be supplemented with brief information on motiv/ornament and colours. However, the degree of detail that can be given in the description of illuminations is virtually unlimited. For non-specialists we recommend to aim for a basic description that should not take too much time, but still gives someone who does not have access to the manuscript or images thereof a good overview as to how many and what kind of illuminations the manuscript contains. In the specifications below, initials will be discussed separately from other illumination types (see ch. 7.2.1 for initials and ch. 7.2.2 for other illuminations), because they partly require different terms and procedures in the respective entries. Please note, that the listing of illuminations in the header does not separate the major initials from other illuminations, but registers all instances consistently in the order of their occurrences in the manuscript. The occurrence of minor initials, on the other hand, can be summarized at the end (as in the example above). Common categories, that apply to both various initials and other illuminations may be treated subsequently (i.a. colours, captions, hands and dating). Initials are according to their hierarchy distinguished into two categories in the manuscript which are treated differently: major and minor intials (see below). It is good practice to register all major initials in the same way as other illuminations in the chronological order as they appear in the manuscript (i.e. in a separate <decoNote> element). Minor initials may be summarized at the end of the list in a common <decoNote> element for each subtype. Each entry for an intial should, as a minimum, comprise information on the following: a) Folio/column, b) Decoration and hierarchy, c) Letter, size and colour(s). The occurrence of the different subtypes of the initials has to be assessed for every manuscript individually. Manuscripts often comprise different initial subtypes that can be distinguished both by their hierarchy in relation to the structure of the text as well as by their size and degree of decoration. When, however, the traditional chapter division of a text or other structural interpretations common in printed editions do not match the hierarchy indicated in the manuscript by means of size and decoration of the initials, the subtypes are treated according to the manuscript's own hierarchy. The possible subtypes for initials are: opening initial, text initial, chapter initial, paragraph initial and sentence initial (littera notabilior). Most manuscripts do not comprise all subtypes; their occurrence can depend on the genre, the number of the works included in the manuscript, and the general degree of illumination. One has, thus, to identify which levels are present in the manuscript and meaningful to be distinguished (see also 7.3.2 Hierarchy of initials). Fig. 7.1. AM 45 fol., f. 8va, l. 19-36, foliate text initial “h”. In column b next to it is an example of a chapter initial in this manuscript. foliate text initial h, 8 l.
colour-stroked paragraph initials, 2-3 l.
Please note that it is also of interest to register missing initials, i.e. those cases where an initial was laid out, but the allowed space was never filled. Sometimes, these instances contain guiding notes for the illuminator e.g. indicating the respective letter to be filled in (guide letter). Initials occur in various shapes and decorations. The overview below lists characteristic initial forms and common modes of decoration that are desirable to identify with the correct terms. Please note that the forms and decoration often occur in combination and the encoder would in these cases indicate more than one form or decoration, e.g. 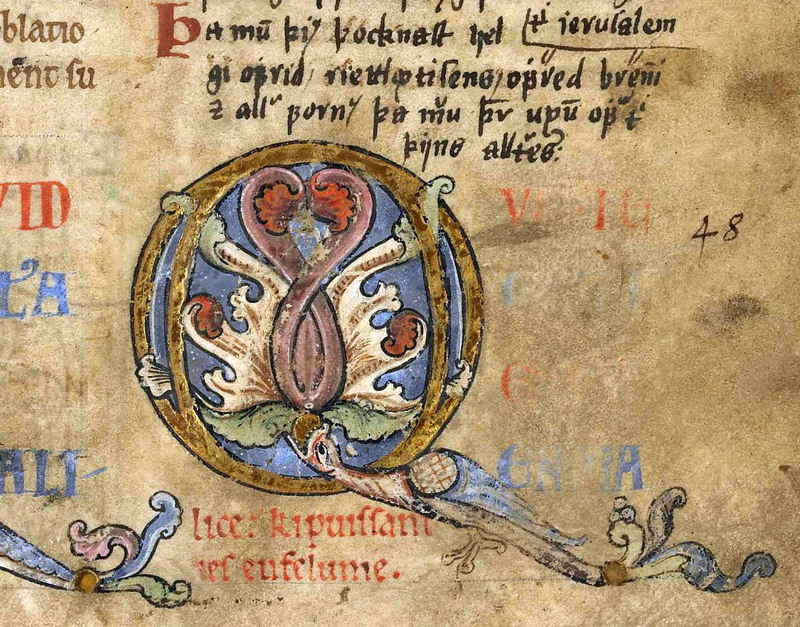 a dragon initial that is foliate. Certain forms and modes of decoration, however, are mutually exclusive, e.g. a versal cannot be inhabited. Fig. 7.2. GKS 1154 fol., f. 35r, l. 18–32. Historiated initial The initial comprises identifiable representational motifs with an illustrative function (i.e. referring to the content of the text). It is desirable to identify the motif of a historiated initial. 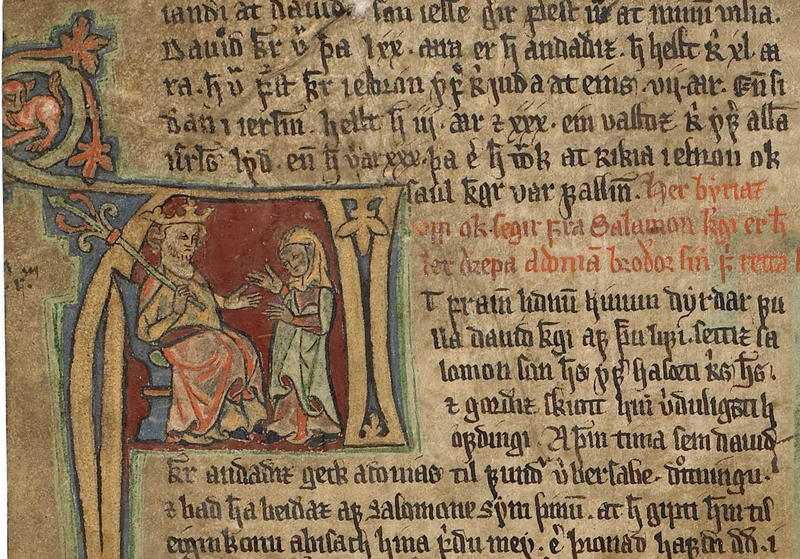 In the example: Historiated initial “E” showing the lease of land by handshake in Landsleigubálkr of King Magnús Lagabætir's landslov in GKS 1154 fol., Hardenberg's Codex, f. 35r, l. 18–32. Fig. 7.3. AM 334 fol., f. 1va, l. 1–20. Foliate initial The initial is decorated with botanical decoration as creeping branches with leaves, buds and flowers or spiral vines. Foliage can elongate the shafts of a letter into the margins in the form of termination. In some cases, the termination can be so much elaborated that the foliation frames the page's text. In contrast to borders, however, the text area is not decreased by the foliation. 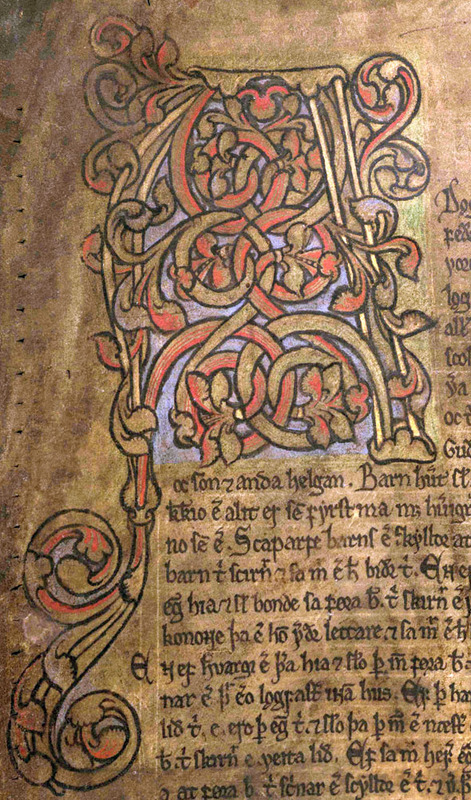 In the example: Foliate initial “A” with spiral vines and curlicue in AM 334 fol., Staðarhólsbók, f. 1va, l. 1–9. Fig. 7.4. GKS 1154 fol., f. 5v, l. 15–27. Pen-flourished initial Fragile embellishment executed as very fine hair-lines solely in (coloured) ink. Placed in the counter of the letter it is called infilling; when attached to the letter it is called external pen flourish, and it often ends with tendril extenders that extend widely into the margins. In the example: Pen-flourished initial “n” with delicate tendrils executed with dark blue ink and pen. 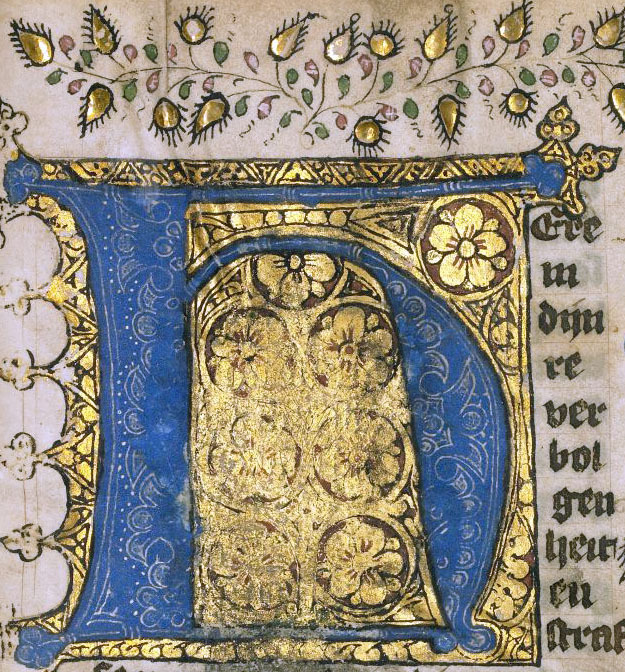 The body of the initial is decorated with gold leaf. 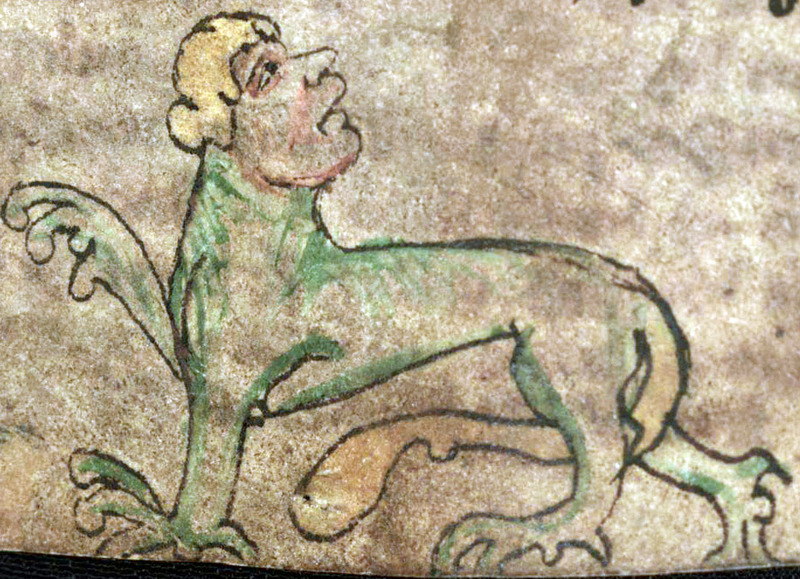 Found in GKS 1154 fol., Hardenberg’s Codex, f. 5v, l. 20–23. Fig. 7.5. Lbs 781 4to, f. 6v, l. 26–28. Penwork initial Initial solely drawn with a pen (not a brush) with a subdued degree of decoration as loops and curlicues. Mostly found in early modern manuscripts using the same ink as the main text. In the example: Penwork initial “S”, as they often appear in early modern manuscripts, in Lbs 781 4to, f. 6v, l. 26–28. Fig. 7.6. AM 795 4to, f. 24v, l. 1–8. Interlaced initial The body of the initial is formed by geometrically interwoven and knotted ribbons. 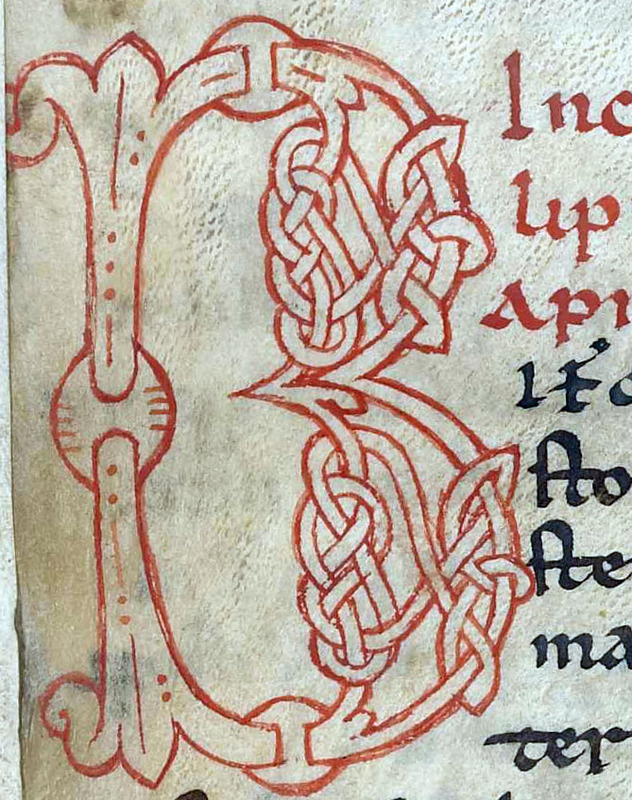 In the example: Interlaced initial “B” in AM 795 4to, f. 24v, l. 1–8. Fig. 7.7. Mh. 18, f. 6r, l. 13–16. Puzzle The body of the letter is excecuted in two (or more) contrasting colours, leaving a thin white gap inbetween. 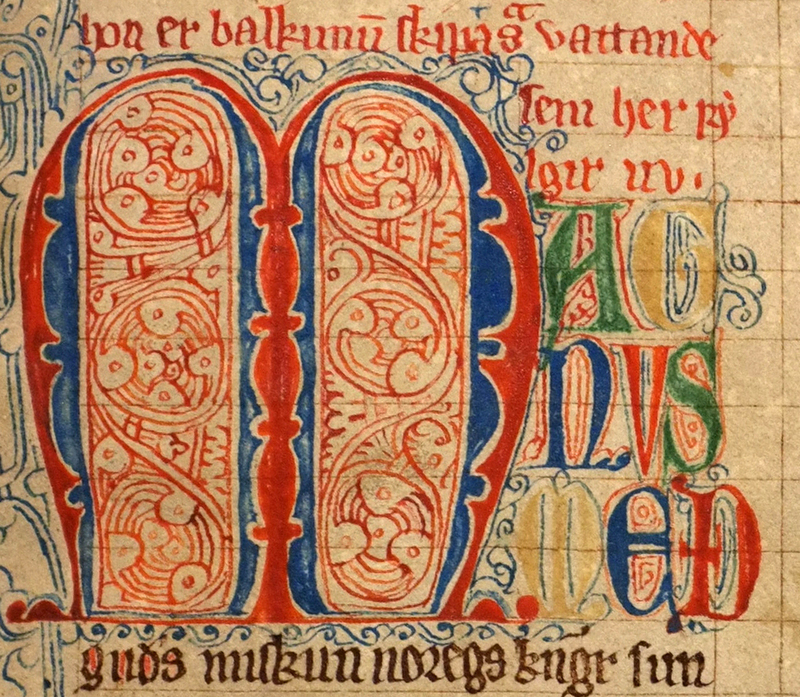 In the example: Puzzle initial “B” in red and blue in Lund, Medeltidshandskrift 18, f. 6r, l. 13–16. Fig. 7.8. AM 76 8vo, f. 23v, l. 10–17. Zoomorphic initial The body or part of the initial is formed by an animal. Please indicate in the description which kind of animal it is (for dragons: see dragon initial below). 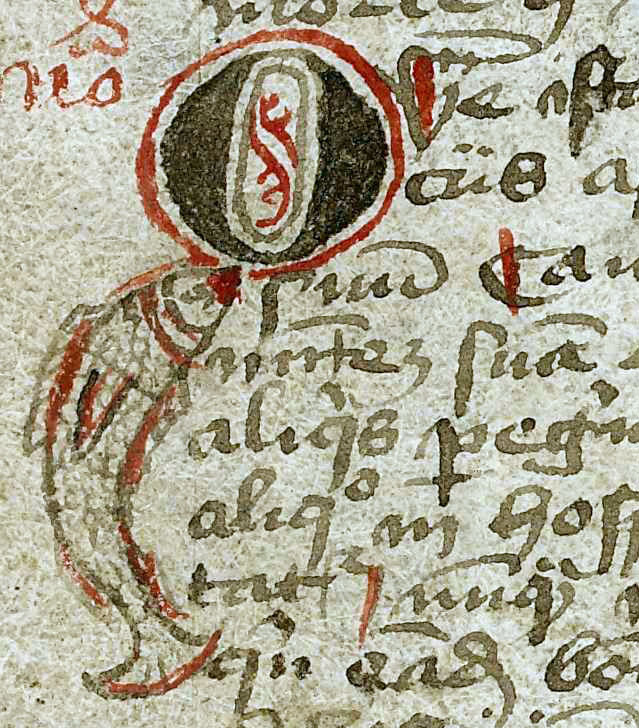 In the example: Zoomorphic initial “Q”, the cauda of the letter is in the shape of a fish in AM 76 8vo, f. 23v, l. 10–11. Fig. 7.9. Mh. 6, f. 6v, l. 1–7. Dragon initial The body of the letter or part of it is formed by a dragon. Dragons usually have fanged jaws, feathered wings and two legs with claws. 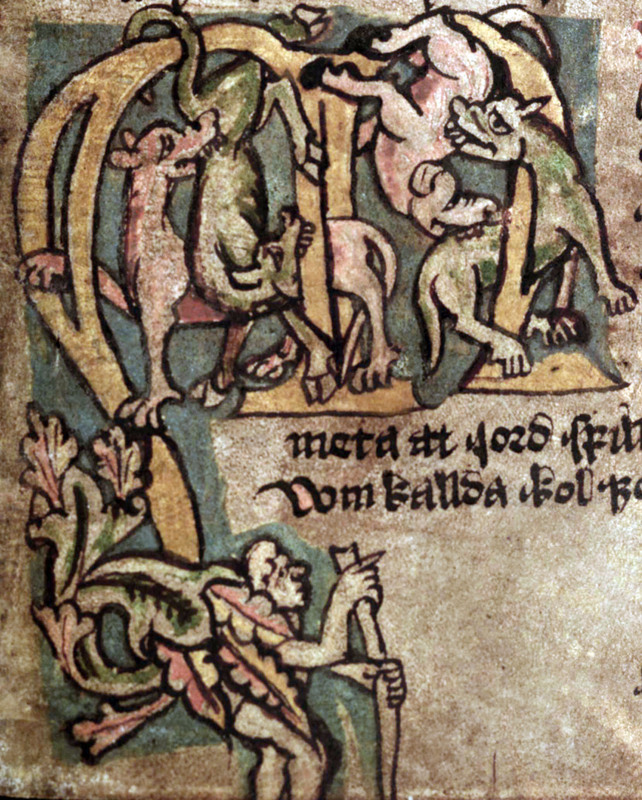 In the example: Two-headed dragon forming part of the body of the foliate initial “a” in Lund, Medeltidshandskrift 6, f. 6v, l. 1–6. Fig. 7.10. AM 147 4to, f. 89r, l. 16–24. Inhabited initial Human, animal or fantasy creatures are placed within the letter or its foliage, often playfully climbing in it with a solely decorative function. It is desirable to identify the kind of inhabiting creatures. Inhabited initials are distinct from historiated initials by not illustrating or referring to the content of the text (see also historiated initials above). 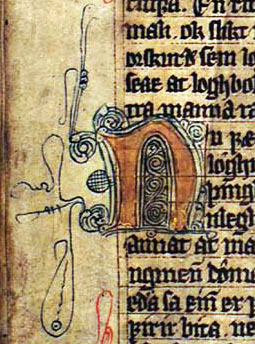 In the example: By climbing canines inhabited initial “M” in AM 147 4to, Heynesbók, f. 89r, l. 16–22. Fig. 7.11. AM 65 4to, f. 4v, l. 16–20. Lombard Enlarged letter in a rather bulgy and rounded shape, usually plain-coloured with no further decoration but at times more elaborated. In the example: The lombard “E” in AM 65 4to, f. 4v, l. 17–18. Fig. 7.12. AM 45 fol., f. 18va, l. 31-38. Versal The first letter of a line is clearly out-dented into the left margin, frequently with no or only little decoration and using the same ink as the text. Versals are usually used for minor initials and are often not much higher than what corresponds to a single line of text. Please note, however, that versals can occur on different levels of the initial hierarchy. 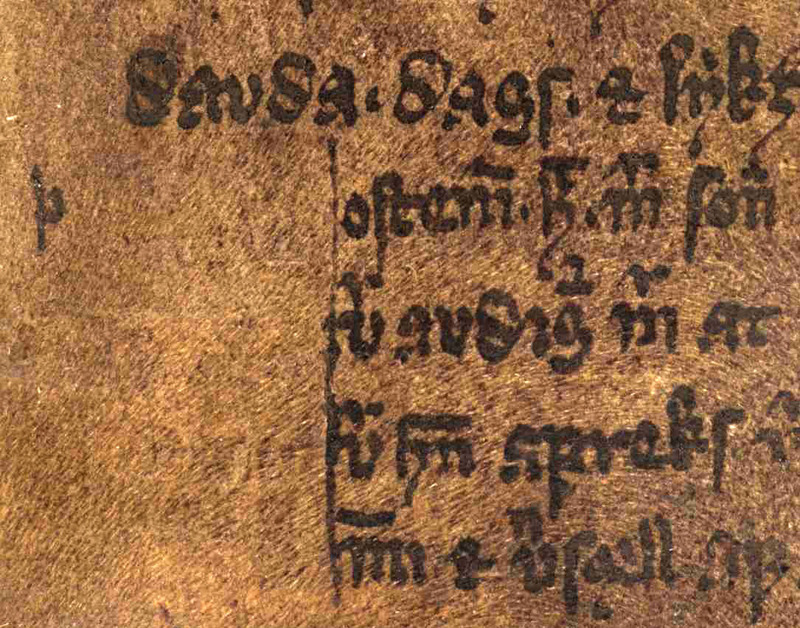 In the example: Sentence initials executed as versals at the beginning of every stanza of Hákonarmál in AM 45 fol., f. 18va, l. 31–38. Fig. 7.13. NKS 2237 4to, f. 4v, l. 18–24. Colour-stroked initial Sentence initials that are hightlighted by an additional stroke of ink, usually in red. 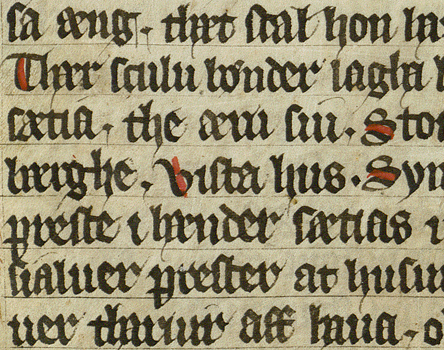 In the example: Red colour-stroked sentence initials in NKS 2237 4to, f. 4v, l. 18–24. Fig. 7.14. AM 56 4to, f. 1r, l. 5–11. Incipit The incipit of a text written in display script, i.e. enlarged, colored, decorated or written in another script. In the example: Coloured (green, yellow, blue, red) and enlarged incipit “AGNVS MEÐ” with red and blue pen flourish, following the pen-flourished puzzle linitial “M” (red, blue) in AM 56 4to, f. 1r, l. 8-10. Fig. 7.15. AM 789 4to, f. 2v, l. 11–30. Missing initial The initial has been cut out or is omitted, i.e. space has been left for it but it was never filled in. Sometimes small guide letters indicate the planned letter to the illuminator (see also guide letter). In the example: The text initial “M” has been cut out, also removing the foliation extending in the outer and lower margin in AM 789 4to, f. 2v, l. 13-19. Fig. 7.16. AM 557 4to, f. 3r, l. 26–30. Guide letter A small letter in the margin or the indented space for the initial indicating to the illuminator which letter to draw. Guide letters are found both in combination with executed initials and missing ones. 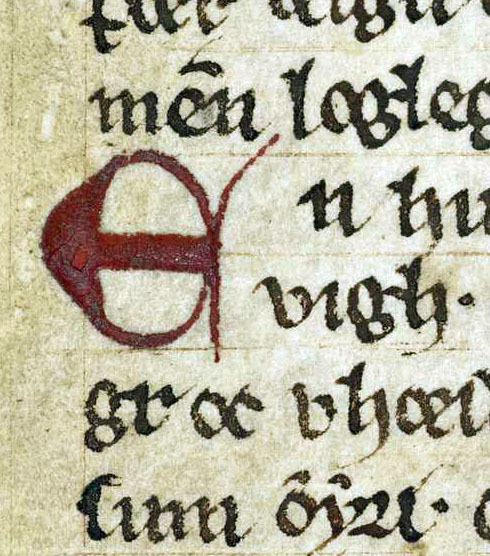 In the example: The missing initial “Þ” that was planned, but never executed as is visible from the indented four lines of the text, and the guide letter “þ” in the margin in AM 557 4to, f. 3r, l. 26–30. [Anything else] All other instances: Name what you see (incl. representative motifs and figural ornamentation). Table 1. Fig. 7.2–7.16 listing the most common initial forms and and modes of decoration. pen-flourished chapter initial L, 3 l.
A longer and somewhat more detailed description that would obscure the readability if provided in the beginning may be given later in the <decoNote> (see ch. 7.2.7). In the same way as for the major initials, each occurance of the other illumination types, for instance a miniature, is registered in a separate <decoNote> element in the header. A register entry of illuminations other than initials comprises as a minimum of the following: a) Folio/column, b) Type and motif/ornament, c) Caption (if applicable), d) Colours. When registering illuminations in <decoNote> , the place of occurence is given, followed by the identification of the illumination type. The different types are characterized by their position and size in relation to the written text. The following table gives an overview over the most frequent types of illuminations (other than initials) that we consider desirable to be identified. Fig. 7.17. AM 421 12mo, f. 47v–48r. Full-page illumination Illumination, often framed, covering the size of the written area elsewhere in the manuscript. 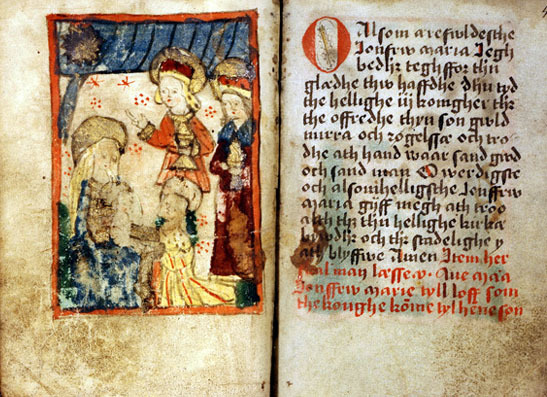 In the example: Full-page illumination depicting the adoration of the Magi in AM 421 12mo, Marine Jesperdatter’s prayer book, f. 47v–48r. Fig. 7.18. AM 733 4to, f. 5va, in between l. 20–21. Miniature Illumination within the written area that is not connected to an initial. A miniature is usually framed and its size corresponds to the width of the column. The motif frequently illustrates a passage of the text. 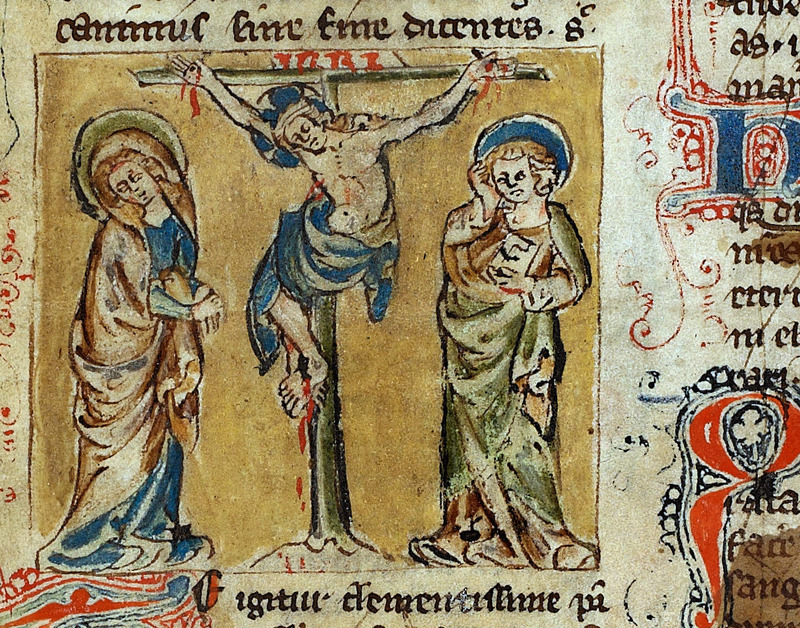 In the example: Framed miniature showing Christ on the cross with Mary and John on either side in AM 733 4to, f. 5va, in between l. 20–21. Fig. 7.19. AM 132 4to, f. 29v, bottom margin. Marginal drawing Drawings outside the written area, usally unframed and not connected to any initial. The drawing can be placed in all four margins of a page, but appear most frequently in the outer and lower margins. The motifs can refer to the written text but can also be of playful character. In the example: A marginal drawing showing a bishop and a bearded grotesque figure sticking out its tongue in AM 132 4to, f. 29v, bottom margin. Fig. 7.20. GKS 1154 fol., f. 2v, lower margin. Bas-de-page Elaborate drawing that usually covers most of the lower margins and that is connected to a bar attached to an initial. The often playful motifs (drollery) can refer to the written text or other illuminations on the page. In the example: Bas-de-page with two jousting knights riding towards each other. The illumination is placed on a bar that is attached to the initial “F” in GKS 1154 fol., Hardenberg’s Codex, f. 2v, lower margin. Fig. 7.21. 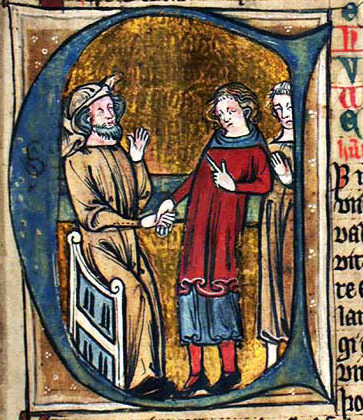 AM 71 8vo, f. 17r. Border Outstanding illuminated margins that frame the incipit of a text (or section), significantly reducing the the written area of a page. They usually co-occur with extraordinary enlarged and decorated initials (cf. incipit page). Borders can either be ornamental (foliate, inhabited) or historiated (with identifiable representative motifs). 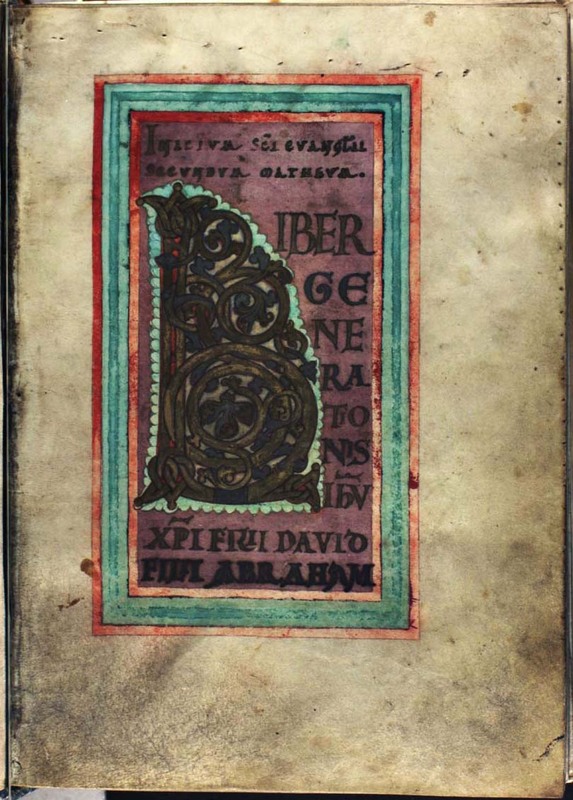 Rare in manuscripts that were produced in Scandinavia. 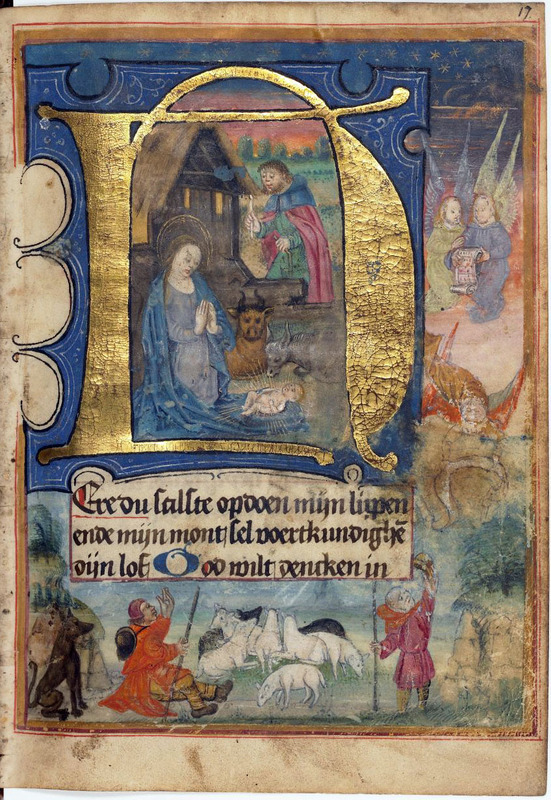 In the example: Historiated border in a Dutch prayer book with a historiated initial depicting scenes from the birth of Christ in AM 71 8vo, f. 17r. Fig. 7.22. Thott 21 4to, f. 5r. Incipit page Decorated page highlighting the beginning of a text (or section) comprising the incipit in enlarged display script and an extraordinary enlarged initial. The background is usually coloured and framed. The focus is on script and there are usually no ornaments or figurative motifs exceeding/beyond the initial (cf. border). In the example: Framed incipit page opening Matthew’s gospel comprising a foliate initial and the incipit in display script on purple ground in Thott 21 4to, f. 5r. Fig. 7.23. GKS 3274 a 4to, f. 22v. Display page Unframed page with solely enlarged, decorated display script, often the incipit of a text (or section), sometimes before or after a larger initial (cf. incipit page). In the example: Unframed display page with colored display script opening Rekabálkr of Jónsbók, in GKS 3274 a 4to, f. 22v. For examples see ch.7.2.1 Initial Enlarged and decorated letter. See ch.7.2 for a detailled directions. Fig. 7.24. AM 4 4to, f. 3r, l. 11–18. Line fillers More or less elaborate ornaments filling the unwritten whitespace of written lines, typically the last part of the line: They can be simple (coloured) lines, but sometimes they depict serpents, fish or other animals. The occurrence of line fillers can be summarized at the end of the list. 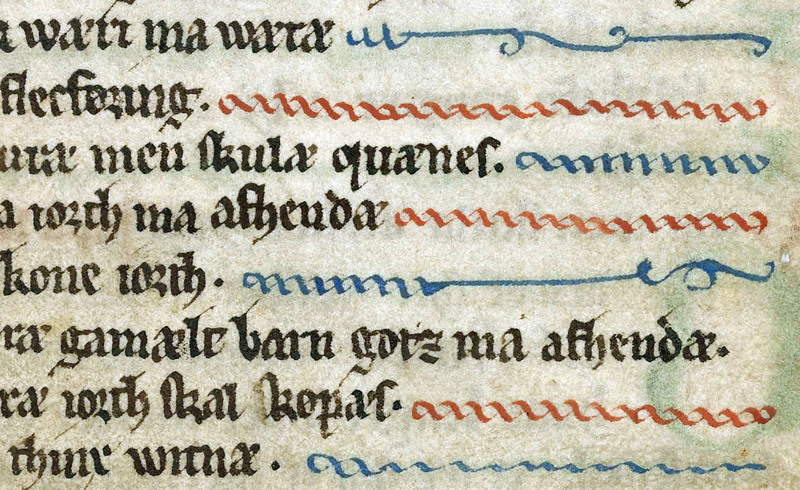 In the example: Red and blue line fillers in AM 4 4to, f. 3r, l. 11–18. Fig. 7.25. Lbs 781 4to, f. 17r. Frieze Ornamental horizontal element above, within or below the text, usually covering most of the width of the written area. In the example: Horizontal frieze drawn with ink placed below the script and illuminations in Lbs 781 4to, f. 17r. Fig. 7.26. Lbs 781 4to, f. 4v, upper left corner. Cartouche Frame comprising a short caption, usually emulating three-dimensional organic forms. In the example: A cartouche comprising the caption of the illumination of a hand in Lbs 781 4to, f. 4v. Vignette Small ornamental element at the end of a text, as often found in early modern manuscripts. They often co-occur with half-diamond indention of the explicit of a text. 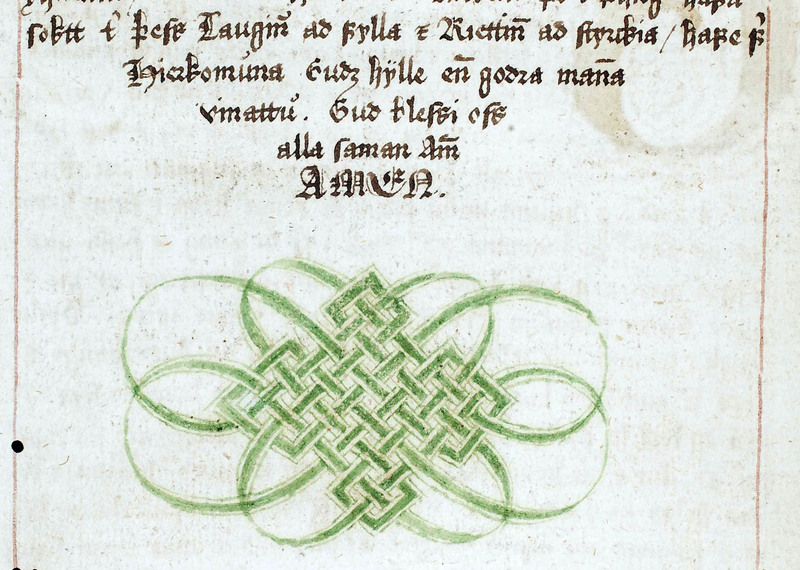 In the example: A vignette with a geometrical interlaced ornament below the end of a chapter in GKS 3274 a 4to, f. 250v. Fig. 7.28. 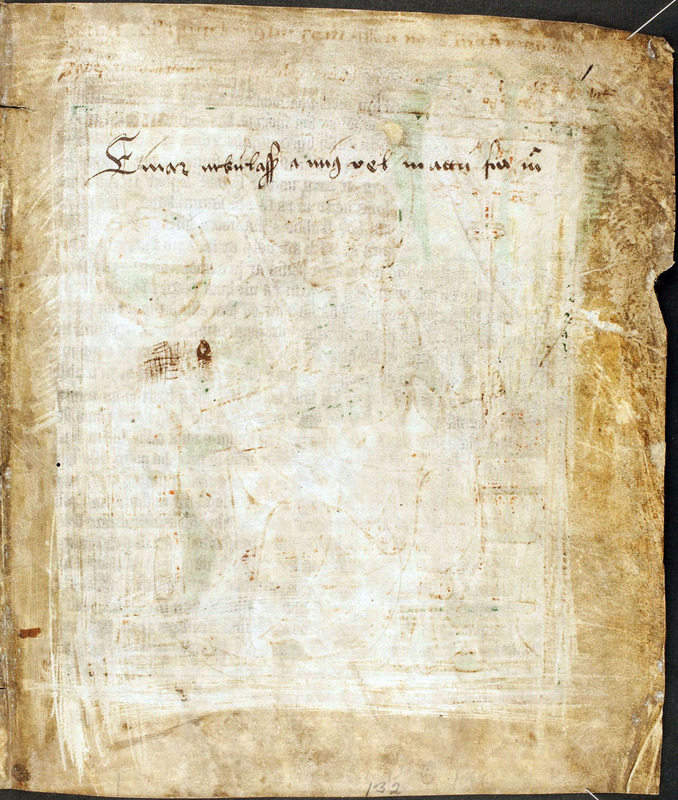 AM 76 8vo, f. 11r, l. 16–22. Maniculus (pl. -i) A small hand in the margin pointing at a word or phrase of the written text. 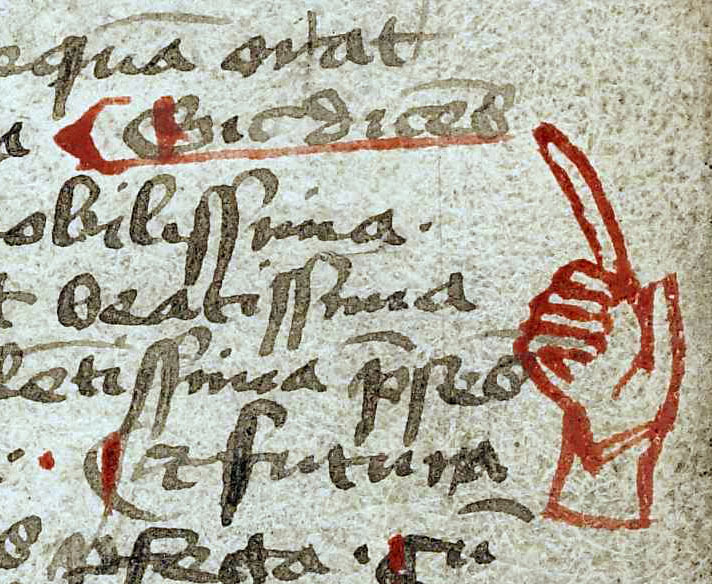 In the example: A red maniculus in the outer margin of AM 76 8vo, f. 11r, l. 16–22. Fig. 7.29. AM 132 4to, f. 1r. Missing illumination Illumination that has either been laid out, but the allowed space was never filled, or has later been scraped off or cut out. It will be registered in the header similarily to missing initials. Instances of left blank spaces can contain notes for the illuminator that indicate the planned motif. In the example: The full-page illumination in AM 132 4to, f. 1r was scraped off at a later point leaving a brighter area. The outlines of the former illumination can still be perceived, it showed a seated king with a haloed crown and in his hands an orb, an axe and a cross-staff; probably St. Olaf. Table 2. Fig. 7.17–7.29 showing the most common types of illumination. Examples applying these terms are given in the following section dealing with motifs. Please note that the occurrence of minor but highly frequent illumination types (e.g. line fillers and maniculi) can be summarized at the end of the list, similar to minor initials (see ch.7.2.1.1). Furthermore, it is of interest to register missing illuminations as they document conditions of manuscript production (e.g. planned, but not executed elements), intented text structure or re-use (e.g. removed at a later point in time). The motifs and composition of the various illuminations is normally listed using basic key words. As for the decoration of initials, a longer and more detailed description that would obscure the readability if provided in the beginning, may be given later in the same <decoNote> (see ch. 7.2.7). Representational motifs include both objects as well as animate beings, such as humans, animals or hybrid creatures. To register these, one simply identifies what one sees (as best as possible) and briefly names the depicted objects, beings and scenes. The description is given in free text, possibly supplemented by a distinctive attribute, e.g. “sword”, “hanged thief”, “dog”, “bearded face”, “gryllus”. In case of a narrative scene a verbal phrase may be used, e.g. “man hitting mermaid with a sword”, “judges leading thief to the gallows”. Terms for some rather specific, but frequent motifs are explained in the following overview. Fig. 7.30. AM 350 fol., f. 15ra, l. 10–16. Bearded face The counter of an initial is filled with a drawing of a (bearded) face. Common in chater initials. 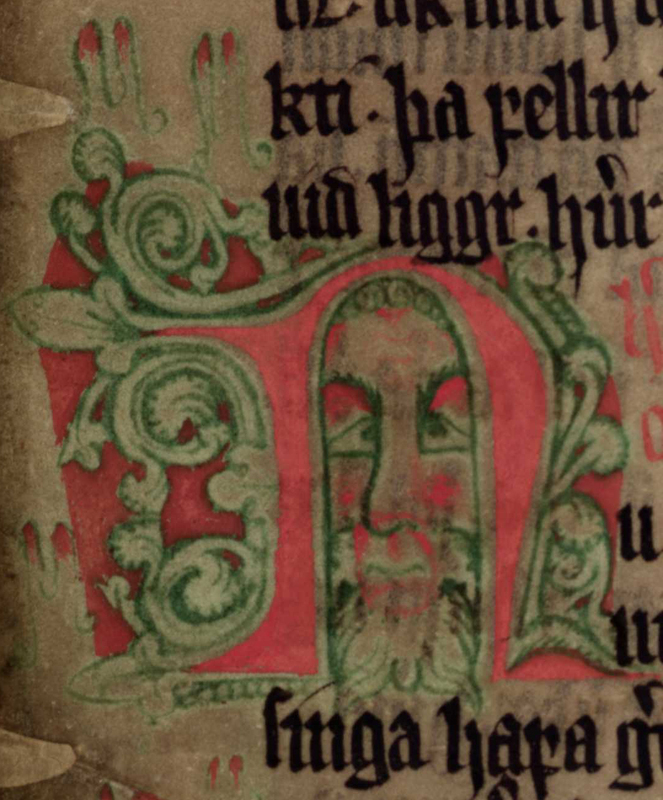 In the example: A bearded face found in the counter of the initial “n” in AM 350 fol., f. 15ra, l. 12–15. Fig. 7.31. AM 732 b 4to, f. 3r, below l. 1. Diagram Two-dimensional schematic representation combining script and usually rather geometrical forms as lines and circles. Please indicate the represented content. 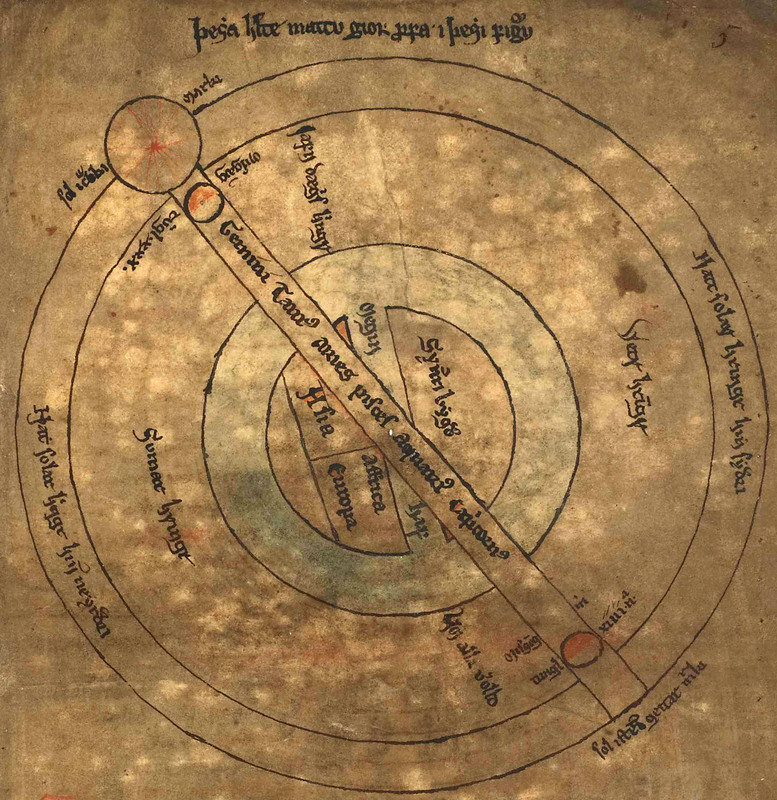 In the example: Diagram showing the position of the earth, sun and moon in AM 732 b 4to, f. 3r, below l. 1. Fig. 7.32. GKS 1005 fol., f. 5v, bottom margin. Drollery Playful and funny motifs in general, e.g. a fox hunting a rabbit, grylli or a knight fighting a snail. 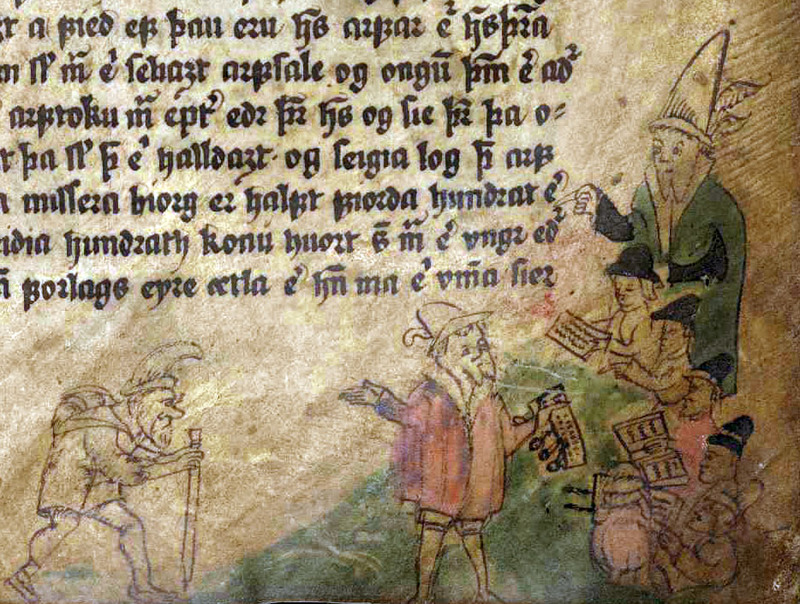 In the example: A drollery scene with a man with a helmet and twisted arms as well as a cloven-hoofed canine chasing a bird in the bas-de-page of GKS 1005 fol., Flateyjarbók, f. 5v, bottom margin. Fig. 7.33. AM 147 4to, f. 23v, bottom margin. Grotesque A hybrid fantasy creature of usually human and animal components. 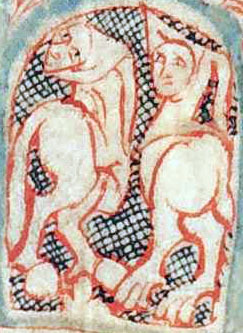 In the example: A quadruped grotesque with a human head and a long tail in AM 147 4to, Heynesbók, f. 23v, bottom margin. Fig. 7.34. GKS 1005 fol., f. 6vb, 46-50. Gryllus (pl. -i) Playful grotesque creature usually braod-bottomed with two animal rear legs and a human face; often with a tail and wearing a gugel. 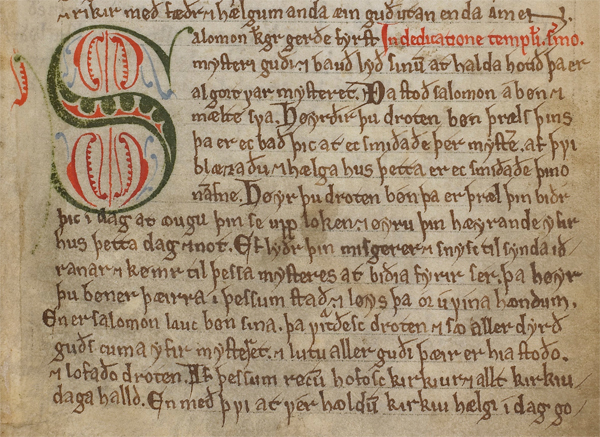 In the example: Two hooded grylli in the counter of an initial of GKS 1005 fol., Flateyjarbók, f. 6vb, l. 46-50. Fig. 7.35. Mh. 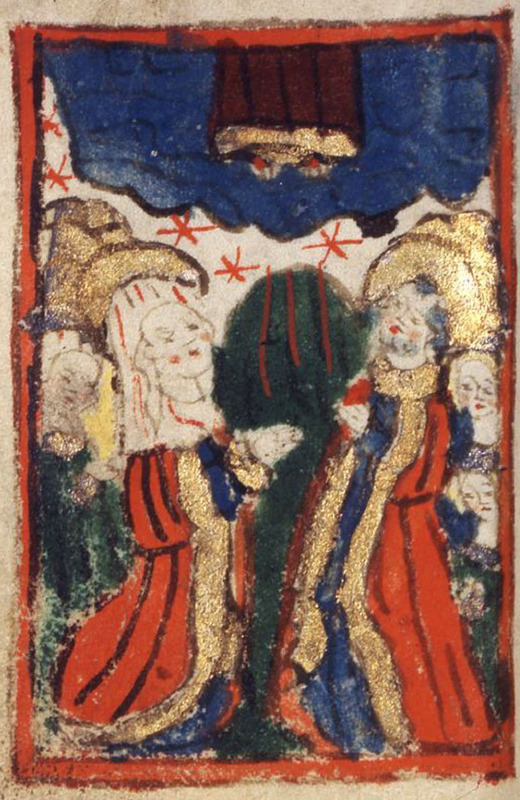 15, f. 140v, bottom margin. Labours of the month Images of agricultural activities connected to the individual months, usually in connection with calenders. In the example: Haymaking with a scythe in July and harvesting the crops with a sickle in August from a calender in Lund, Medeltidshandskrift 15, f. 140v, bottom margin. Fig. 7.36. AM 732 b 4to, f. 8v. Maps A two-dimensional representation of real or imagined places often with captions. Please indicate the represented place(s). 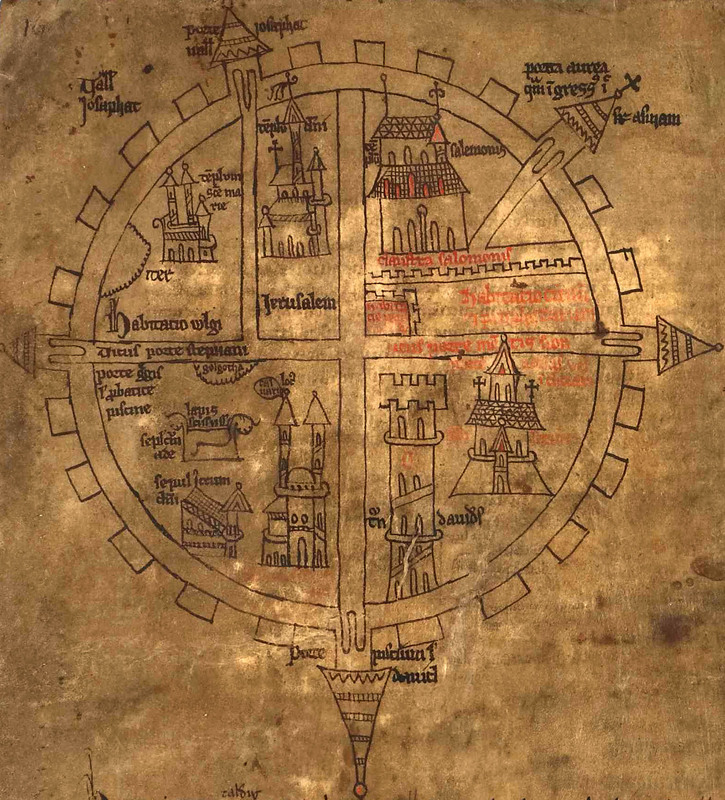 In the example: A map of Jerusalem in AM 732 b 4to, f. 8v, upper half of the page. Fig. 7.37. Lbs 781 4to, f. 46r, upper left corner. represented sign, i.e. Aries, Taurus, Gemini, Cancer, Leo, Virgo, Libra, Scorpio, Sagittarius, Capricorn, Aquarius or Pisces. 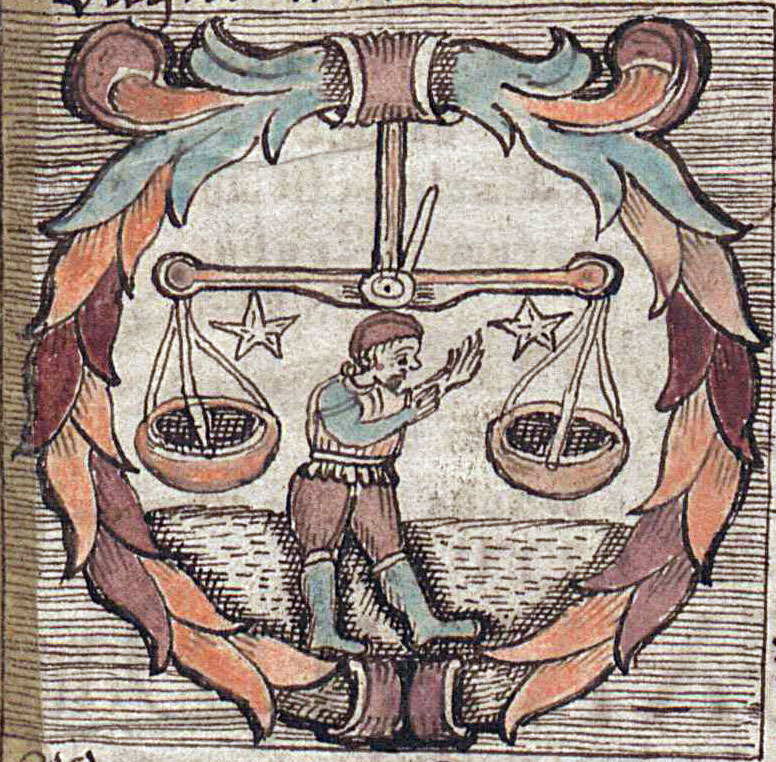 In the example: A miniature showing the Libra of the zodiac signs in Lbs 781 4to, f. 46r, upper left corner. Table 3. Fig. 7.30–7.37 showing common motifs found in illuminations. bas-de-page, two dogs running, a lamb and a bird. In case of abstract motifs such as ornaments, the form and type(s) as well as potentially involved motifs are described as best as possible. It is relevant to note the usage of different shades of ink and colours and (their distribution) in both initials and other illuminations. Among others, this helps understanding the indented structure of a text from the hierarchy of the initials and other illuminations. This is particularly relevant for readers who do not have access to either the manuscript or colour photographs thereof. In the optimal case the colours and their hues are listed separately for each <decoNote> . However, the colours may also be usefully be given in a summary, e.g. in the case of alternating use of colours as occurs frequently with initials. It would be desirable to be as accurate as possible with regards to naming the colours with reference to the pigments and inks used (e.g. white lead, massicot, orpiment, yellow ochre, burnt sienna, minium, vermillion, madder, crimson, burnt umber, azurite, cobalt blue, ultramarine, woad, malachite, verdigris, raw umber etc.). Nonetheless, such identification is often not possible from the available images or without scientific analysis. Therefore, if it is not possible to determine the pigments used, we encourage encoders not to hesitate to use simple descriptions such as “light blue” or “brown red”. If applicable, the colour hue of the outline of the illumination can be listed seperately in the end prefixed by “Outline: ”. Fig. 7.38. AM 345 fol., f. 1v. 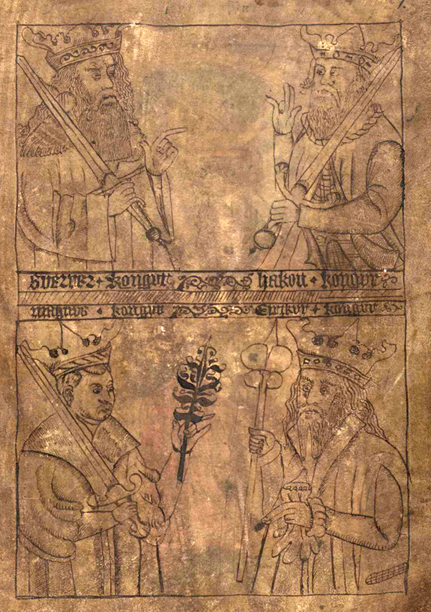 full-page illumination, Holy King <name type="person">Óláfr</name>. Colours: yellow, dark green, light red, black. 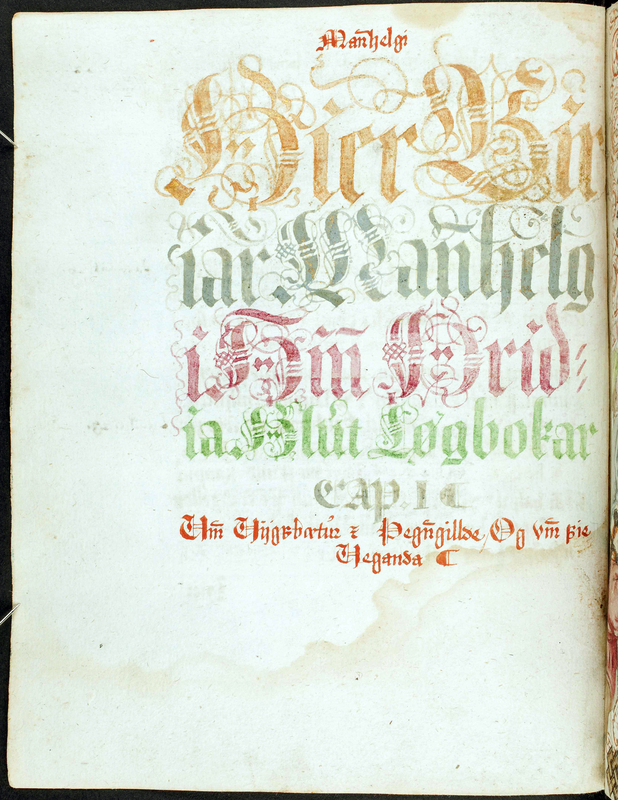 Note: The colours of initials are also described as part of the encoding in the transcription (see ch. 7.3.4). There, however, colours found in individual initials are only encoded in a simple manner. Consequently, we recommend to include the detailed – and potentially more specialized – description in the manuscript description, i.e. as part of the header, instead. Illuminations, including initials, can contain captions. If present, the text of captions should be transcribed separately. Like other transcriptions from the manuscript, transcriptions of caption are treated as quotes in the header and, thus, they are wrapped in <q> -elements. The example below shows how the caption found in the illumination on f. 1r of AM 345 fol. may be transcribed. Fig. 7.39. AM 345 fol., f. 1r. We consider the description of illumination techniques optional, but encourage their inclusion if possible. In most cases it should not take too much effort to identify the technique and if the same technique was used consistently throughout the manuscript it can be summarized. It will give – similar to the mentioning of the used colour hues – a much better impression of the decoration to a reader without access to the manuscript or images thereof. If the techniques vary from illumination to illumination this fact should be indicated and described in the prose of the separate <decoNote> elements. Fig. 7.40. AM 71 8vo, f. 73, l. 1–10. Gold leaf Thin layers of gold foil applied onto the page that can be further decorated, i.a. by burnishing, tooling or painting/sgraffito. In the example: The ornamentation surrounding the body of the initial “h” is made of painted gold leaf in AM 71 8vo, f. 73, l. 1–10. Fig. 7.41. AM 421 12mo, f. 71v. Gold substitute Metallic glimmer used as cheaper alternative to gold, sometimes based on tin or silver. These glimmer particles were often soluted in binding agent and applied onto the surface with a paintbrush, frequently leaving the ground or outlines visible. Please note: The usage of yellow colour instead of gold is not meant here. In the example: Liquid gold substitute applied onto the drawings, leaving the outlines of the halos visible in AM 421 12mo, Marine Jesperdatter’s prayer book, f. 71v. Please note: In other instances in this manuscript, the substitute can appear rather silver or even oxidised grey. Fig. 7.42. AM 442 12mo, f. 4v, l. 13–23. Fully painted Opaque colours, often blend colour hues, applied in several layers. 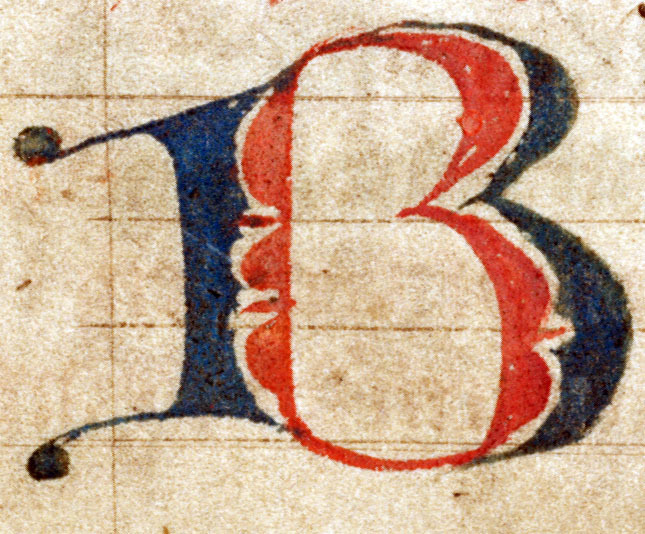 In the example: The initial “B” and botanical ornaments fully painted; light ornaments were applied on dark ground colours in AM 442 12mo, f. 4v, l. 17–23. Fig. 7.43. AM 345 fol., Reykjabók of Jónsbók, f. 27r, bottom margin. Colour wash Transparent colours usually leaving the outline drawing underneath visible. In the example: Red and green colour wash applied onto some parts of an outline drawing, in AM 345 fol., Reykjabók of Jónsbók, f. 27r, bottom margin. Fig. 7.44. AM 132 4to, f. 12r, bottom margin. Outline drawing Lines drawn with an (ink) pen (can be colour washed). In the example: Outline drawing using pen and ink in AM 132 4to, f. 12r, bottom margin. Fig. 7.45. JS 133 4to, f. 37v. Pasted Illuminations pasted into the manuscript, sometimes from sources other than manuscripts, e.g. printed books. 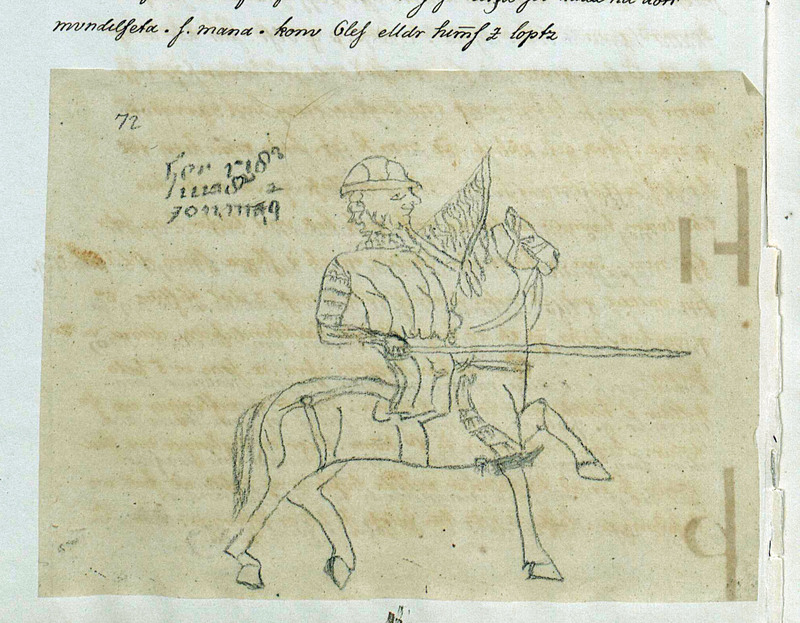 In the example: Outline drawing using a pencil on tracing paper that was pasted onto the preexisting leaf in JS 133 4to, f. 37v. Fig. 7.46. AM 618 4to, f. 37rb, l. 19–28. Reuse in palimpsest manuscript The original script was scraped away but the illuminations were left untouched to be integrated into the new text. In the example: The Old French translation in the right column was scraped off and replaced by an Old Icelandic translation keeping and that way re-using the initial “Q” in AM 618 4to, f. 37rb, l. 21–26. Table 4. Fig. 7.40–7.46 showing common illumination techniques. 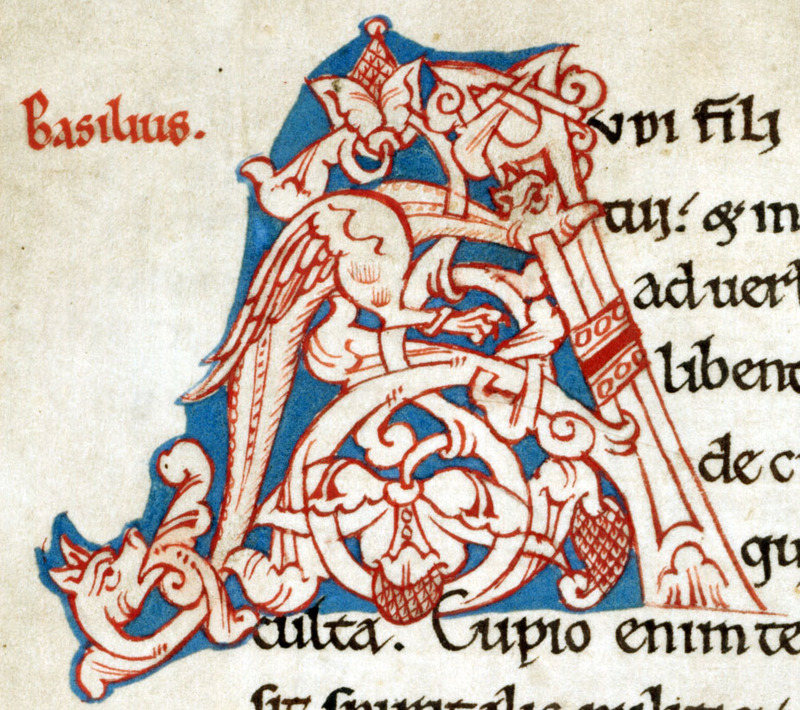 pen-flourished inhabited chapter initial A, 3 l.
Colours: light red (body of the letter), dark blue (pen flourish). With regards to Christian iconography, it is desirable to identify the most common motifs. While it would be sufficient to give a general identification, such as “Christ on the cross” or “female Saint”, more specific descriptions are highly welcome and will increase their value for other researchers. For help identifying Christian iconography we recommend the Iconclass Browser http://www.iconclass.org/help/outline, a tool developed for identification of iconography of art with a special focus on Christian iconography. For example, if you are in doubt about what is depicted in an illumination and the text does not give any clue, you can conduct a combined search in the Iconclass Browser searching for the elements you can identify. A search for “female saint AND wheel”, for instance, will tell you that, according to iconographic tradition, a wheel identifies either St. Catherine or St. Christina. Furthermore, the search results will guide you to identify the female saint as one or the other, depending on other details of the depiction. Finally, in the advanced description part of illuminations it is possible to include more specific art-historical aspects, such as the determination of the illumination style, e.g. gothic, insular, romanesque or renaissance. This section describes how to encode initials, including sentence initials (also called littera notabilior), as part of the transcription. The decoration of initial letters can vary considerably, but the degree of decoration (motifs/ornaments and uses of colours) is usually connected to their function. Thus, a manuscript may have quite large and splendid main initials while at the same time displaying more modest decoration for initials introducing subordinate sections such as paragraphs or sentences. This information is worth to be marked-up in the transcription, so that it can be directly linked to the corresponding text. In the transcription, the mark-up of initials and other emphasized letters is rather standardized and confined to a couple of basic categories. We recommend to use the element <c> , which can take several attributes (see further below). The more detailed description of initials (usually in prose) should be given in the document header as described above (see ch. 7.2). Please note: Besides defining some of the most relevant characteristics of the initials and providing that information in a consistent and thus highly valuable manner for analysis, the initial mark-up in the transcription can be read by appropriate stylesheets that transform the XML transcription for display. However, the display options of XSLT stylesheets may differ, and at the current point of the technical development (that is easily accessible), the display of initials in the Menota-stylesheet is confined to a rather basic approximation. An initial (as any other character) is part of the transcribed text. Therefore, it needs to be written, or rather typed, by the transcriber. In the same way as for other characters, the letter form may be noted and reproduced on the facsimile level using one of the Unicode characters. For instance, an insular capital “F” can be encoded with the entity &Fins; (for more details on characters and encoding rules see chapter 5.2.). The mark-up for further describing the special characteristics of the initial is then built around the character, since it is understood as a qualification of how the letter was executed in the manuscript. If an initial is missing, because it was never filled in, because it has been erased from the manuscript or because it was cut out, the missing letter is indicated – in accordance with the general rules for transcription. The same applies to initials that were added later (see ch. 8.3 for <space> ; ch. 9 for mark-up of scribal or editorial intervention). The mark-up of the missing or added initial is wrapped in the element <c> as normal. The following example shows how a missing initial “N” is encoded using <space> . The attribute @quantity is used on <space> to indicate the number of characters omitted, which is specified by the value 'chars' of the attribute @unit. Fig. 7.47. Hierarchy of initials exemplified in AM 351 fol., f. 2r and 72v. 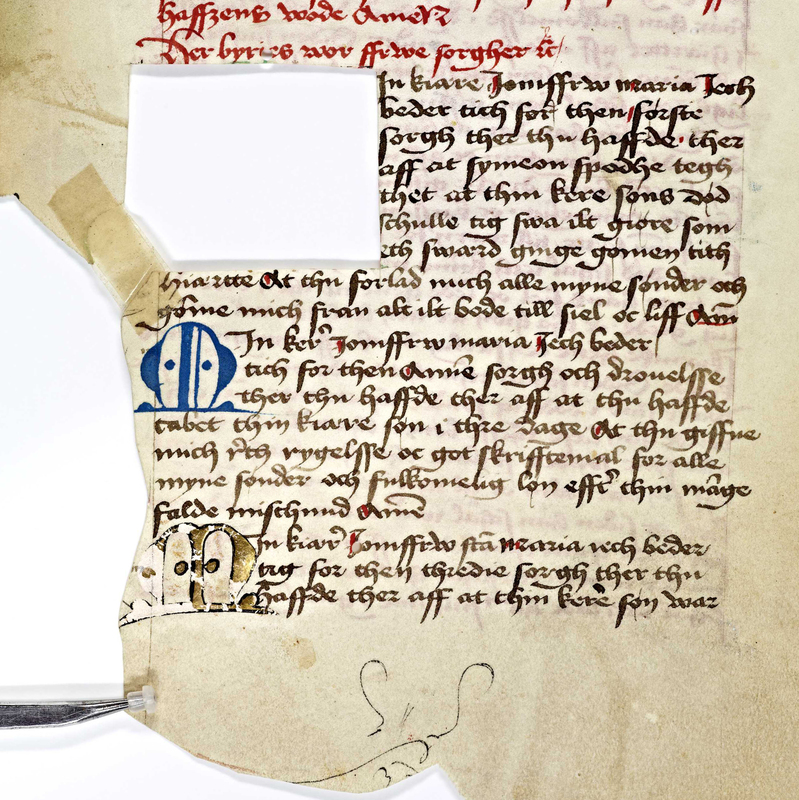 Red: historiated opening initial, 8 l. Yellow: pen-flourished chapter initial, 5 l. Blue: pen-flourished paragraph initials (note that the “I” is not indented), 2-3 l. Green: colour-stroked sentence intials (littera notabilior). In most manuscripts, structurally different types of initials and highlighted characters occur. Usually, the various types are distributed in a systematic hierarchical way and can be identified based on their size, their decoration, their location on the page and their position regarding the text’s overall structure. Going beyond the rough dichotomy between major and minor initials, it is common to distiguish between opening initials, text initials, chapter initials, paragraph initials and sentence initials. The attribute @type (with the value 'initital' ) is used to distinguish the character from other characters that are marked-up by means of the <c> -element, such as hyphens (see ch. 5.5). The more specific attribute @subtype will then indicate the type of the initial, e.g. whether it is a text initial or a sentence initial. If it is not possible to distinguish between more than major and minor initials, however, these two main subtypes may also be used instead. Possible values for @subtype when used for initials are thus: 'opening' , 'text' , 'para' and 'littNot' (for littera notabilior or sentence initial) as well as 'major' and 'minor' . The mark-up of initial subtypes is supposed to represent the hierarchical division indicated in the manuscript by means of the initials' size and their degree of decoration. This categorization is thought to summarize the results of the encoder's analysis considering the overall distribution and presentation of initials in a given manuscript that are specified in more detail in the attributes @style and @rend (see sections ch. 7.3.3 to ch. 7.3.5) . The hierarchical division indicated by the size and artistic features of initials may therefore divert from the traditionally perceived struture of a text, such as chapter divisions in standard editions. If an initial is omitted or missing, this is indicated by the attribute <type> with the value 'noInitial' . Even though this might seem somewhat redundant if other mark-up such as <space> or <gap> is present, it has the advantage that, for instance the subtype and the intended size of the missing initial may be encoded and thus searched for. Defines the subtype of c, if type="initial"
initial 'opening' An opening initial: The first, often largest initial of a manuscript. initial 'text' A large initial at the beginning of a new text (if applicable). initial 'chapt' An initial at the beginning of a new chapter or major section or a text. initial 'para' An initial at the beginning of a paragraph or subunit of a text (if applicable). initial 'littNot' The character is a sentence initial (littera notabilior): The first letter of a sentence is highlighted within the line by means of colour-stroking (i.e. coloured filling of the counters of the letter or a usually red stroke), has minor decoration or is written in slightly enlarged display script. initial 'major' A mjor initial (without any further qualification). initial 'minor' A minor initial (without any further qualification). noInitial 'opening' The opening initial is omitted or missing. noInitial 'text' A text initial is omitted or missing. noInitial 'chapt' A chapter initial is omitted or missing. noInitial 'para' A paragraph initial is omitted or missing. noInitial 'major' A major initial is omitted or missing. noInitial 'minor' A minor initial is omitted or missing. Fig. 7.48. Puzzle chapter initial “S” (l. 16-22) and several sentence initials, for instance in the word Ða in the middle of l. 18 in AM 619 4to, f. 47r, l. 15–29. While a rather plain mark-up as shown in the two examples above would be perfectly valid, we highly recommend also to describe the characters’ specific fatures using additional attributes. We consider it good practice to indicate at least the size (see ch. 7.3.3) and colour(s) (see ch. 7.3.4) in addition to the type and subtype. The size of the initial is often connected to its type and function. In the transcription we recommend to indicate separately the height of different parts of the initial. All measurements are given in natural numbers corresponding to the writing lines on the same page: 1. The initial height, indicating how many lines have been indented – often corresponding to the x-height or cap height of the letter. In case the initial was laid out but never executed, it should still be possible to determine the intended initial height of the non-existing initial due to the space left blank by the scribe; 2. The ascender and descender heights, giving the number of lines that each ascender and descender (or attached shaft) extend above and below the initial height, respectively (usually in the left margin next to the text). Note: The letters “I/J” and “L” present special cases, which are discussed below. In XML, we recommend to indicate the size of initials as part of the @style attribute on the element <c> . In order to document both its size and relative position in the written area, the value of the initial height, i.e. the number of indented lines, is marked-up as a combination of two values. These two values denote separately how many lines the initial height extends upwards including the line on which the character has its logical position in the text (i.e. “up”), and how many lines it extends below that line (i.e. “down”). For example, in the picture below the initial height corresponds to eight writing lines and the character “A” belongs logically on the fourth of these eight lines where it forms part of the word “AT”. In the XML mark-up we therefore indicate that the initial height goes four lines up (i.e. the line that starts with “AT” is indented, and the initial height extends for three more lines above that) and four lines down. The two values together give the total number of indented lines: 4+4 = 8. The initial height of the “A” from the example can thus be marked-up as shown below the image. Fig. 7.49. Historiated text initial “A” in the word AT in AM 226 fol., f. 96va, l. 2-17. Note that the value of @style is given as “u1 d6 md2”, indicating that the initial height merely goes up one line (the line of the initial's logical position) and six lines down from there. The initial also extends below the indented initial height by two lines, which is denoted with “md2”. Since no value is given for “mu”, it is assumed to be “mu0”. This is correct, because there is no ascender exceeding above the initial height. The initial letter “L” is equally sometimes found with fewer indented lines than other letters of the same level of hierarchy. Other than for “I/J”, however, it is common that “L” is formed with an initial height of one (or tow) indented line(s) for the horizontal bar of the letter. The values for “u” is thus often 1 (or sometimes 2), and the value for “mu” equals the number of lines the initials extents above the indented line(s) as normal. When (minor) initials are executed as versals they are entirely out-dented into the margin and, thus, do not have any indented initial height either. The values for “u” and “d” are accordingly omitted as they equal zero. Instead, only “mu” and “md” are encoded (in the same way as for initials that are not indented due to their letter form). Again, the size is denoted relative to the logical placement of the initial in the text counting lines up and down from the line onto which the initial belongs. It is relevant to note the colour(s) of initials and other highlighted characters. If initials are monochrome, i.e. only a single colour or hue is used, one might be interested in if and how the colours alternate with other initials; and in the case of multiple colours or hues, the number and distribution of these may be important with regards to the structural layout of the text. We recommend encoding the colour(s) of initials by adding yet another value to the attribute @style. The value shall be preceded by “c” for colour and can be used to describe both monochrome and polychrome initials. In case of a monochrome letter, either the simple name of that colour/hue or the more precise six-digit hexadecimal CSS colour code (preceded by #) is given. (For standard CSS colours codes and names see e.g. https://www.w3schools.com/cssref/css_colors.asp.) A monochrome red initial would thus take the value “cRed” or “c#FF0000”. If a letter is bichrome, i.e. uses two colours, both colours are given (again either by name or hexadecimal colour code) and separated by an underscore. 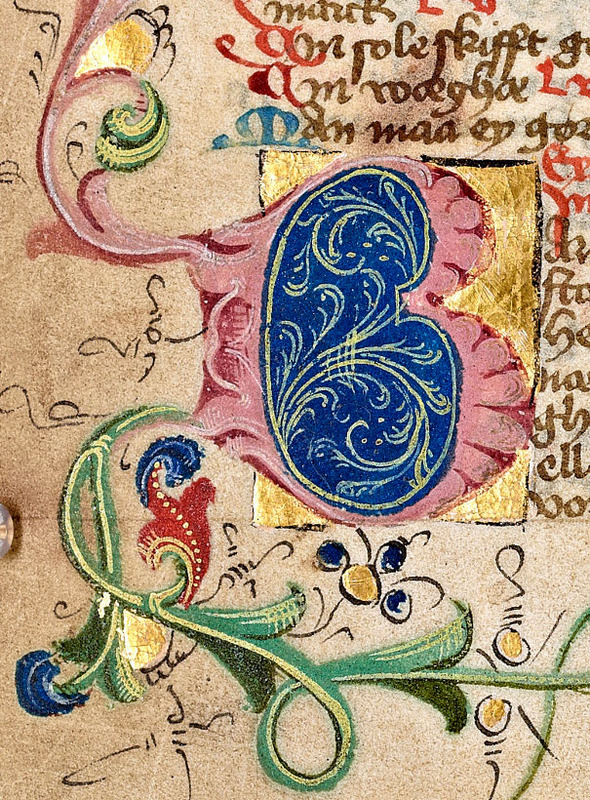 If an initial is truly polychrome, i.e. uses three or more different colours or hues, these are equally listed using underscores. The order in which the colours of bi- and polychrome initials are named should follow the order of importance. In other words, the only (or main) colour/hue of the actual initial, i.e. the body of the letter, is mentioned first, followed by a potential second colour of the actual initial or otherwise the main colour of the ornamentation or decoration. If a clear hierarchy of colours is impossible to establish, for instance if a bichrome initial is drawn with two colours that are used on equal terms, that relationship can be encoded by means of using an equals sign instead of an underscore in between the two colours. However, we recommend limiting the analysis of colours in the context of <c> to a general level. More specific and sophisticated descriptions of initials and the colours used should instead be placed in the manuscript description part of the header (i.e. <decoDesc> inside <msDesc> , see ch. 7.2.1 above and further ch. 14.3.3). If the encoder should be unable to determine the colour(s) employed for executing initials, for instance because they are working from black-and-white images, the indication of color is simply omitted in the transcription. The attribute @rend is used to encode the form and kind of decoration found in or around the initial. This attribute provides a general description of the initial’s artistic rendition without going into too much detail, i.e. by means of keywords only (see the list below). In basic terms the information given here should agree with the description in the header, where a more detailed prose description of the initial's form and its ornamentation can be included (see ch. 7.2.1.2 as well as ch. 7.2.7). The attribute @rend is used for indicating both the way in which an initial is drawn and the main means of decoration/ornamentation. Even the presence of guide letters can be indicated here. In order to encompas all of that information, the attribute can take several values (in no specific order) that are simply separated by whitespaces. However, things should be kept to a minimum. Indicates the rendition and/or composition of the character (usually initial); more than one value may be combined. <c type="initial" subtype="chapt" style="d6 md2 cGreen_Red_Blue"
<c type="initial" subtype="chapt" style="u3 d4 mu5 md28"
In case the encoder wishes to additionally distinguish between different degrees of the same type of ornamentation, a numbering system may be used in addition to the proposed values. For example, if one wants to indicate how elaborate the pen-flourish is in different initials, these can be referred to as 'penFlourish-1' and 'penFlourish-2' , respectively. Please note, however, that such quantifications are neither standardized nor transferrable and thus only apply to observations made for individual manuscripts. We suggest that the encoder explains his or her usage of such distinctions in the <header> if they are employed. The following is an alphabetically organized glossary covering the most common terms used for describing initials and other illuminations used in this chapter. Terms related to the anatomy of initials are moreover illustrated in figure 7.50. Fig. 7.50. The anatomy of an initial exemplified by AM 225 fol., f. 50v, and AM 350 fol., f. 2r. Ascender Upper stem of the letter which can be extended for several lines above the initial height until the top of the page. Attached bar Additional bar attached to the body of the initial elongating the ascenders/decenders. Bar The short horizontal strokes that are attached to the stem to form letters like “E”. Body of the letter The strokes that form a letter, consisting of stems, bars, spines, etc. Cap height Height of the initial including x-height and the ascender which are within the initial height. Chapter initial An initial at the beginning of a new chapter or section or a text. Counter Closed space surrounded by the body of the letter as in “o” or open space defined by the the body a letter as the two spaces in “S”. Curve Rounded stroke forming the body of a letter as in the letter "S". Descender Lower stem of the letter which can be extended for several lines until the bottom of the page. External motif Ornaments outside the body of the initial (i.e. not within the counters). Extender Vines attached to initials elongating shafts or attached bars. Frame Rectangular bars encompassing the decorated background of an initial, similar to a painted picture frame. Ground The framed area of the initial which has an own decoration or colour and often additionally covers the area just around the letter, usually corresponding to the initial height. Infilling Decoration of an initial that is placed in the counter(s) of the letter. Initial Illuminated letter of the manuscript text marking the beginning of a new text, chapter or paragraph. Initial height Number of text lines that were indented to provide space for an initial at the beginning of the text. Major initial The most splendid initials of a manuscript, including opening, text and chapter initials. Medallion Framed rectangular or circular area at the end of initials or as an independent form, which is comprised of motifs or geometric forms. Minor initial Smaller initials, often more subdued in decoration and appearing more frequently, including subchapter, paragraph and sentence initials. Opening initial The first, often largest initial of a manuscript (often if there is only one text in the manuscript). Paragraph initial An initial at the beginning of a paragraph or subunit of a text. Shaft Vertical strokes that form the body of the letter. They can be elongated and terminate in spirals. Sentence Initial Slightly highlighted first letter of a sentence; often placed within a line (also called littera notabilior). Serif Small lateral bar at the end of an initial's main stroke similar to the fine lines on main strokes in printed serif fonts. Termination Terminal part of an initial that is decorated with vines, spirals or the like (usually shafts, attached bars or extenders). Text initial A large initial at the beginning of a new text (if there are several texts in a manuscript). x-height The height of a letter or a part of a letter in between the base line and the mean line, cf. the size of the letter “x”. 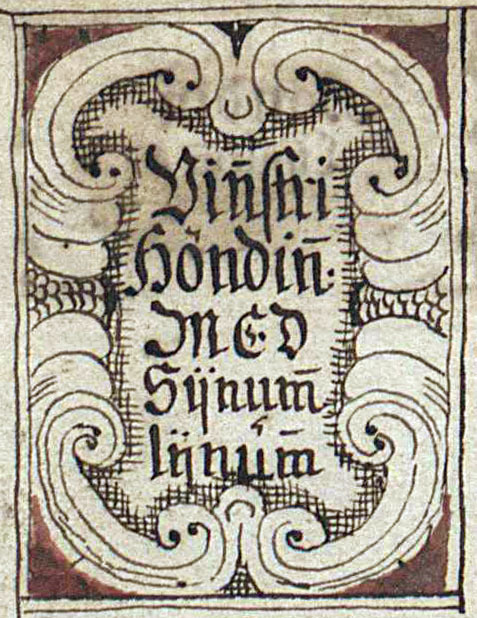 Handrit.org for the manuscripts owned by The Arnamagnæan Collection in Copenhagen as well as the National and University Library of Iceland and The Árni Magnússon Institute for Icelandic Studies, both in Reykjavík. 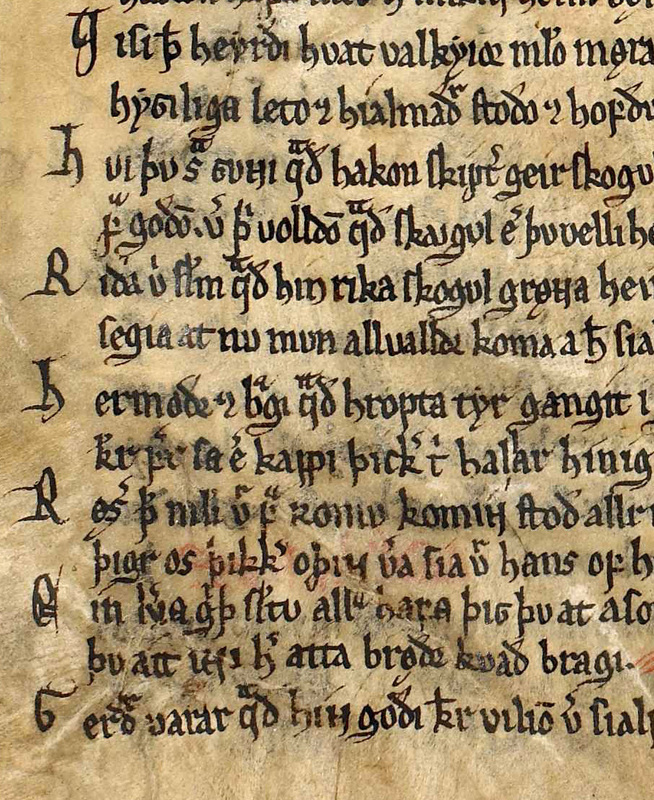 Exceptions are the images of the following manuscripts that had not yet been made available on Handrit: The Árni Magnússon Institute for Icelandic Studies, Reykjavík, AM 345 fol. (accessed via CD-ROM) and The Arnamagnæan Collection, Copenhagen, AM 421 12mo (accessed via http://haandskrift.ku.dk). 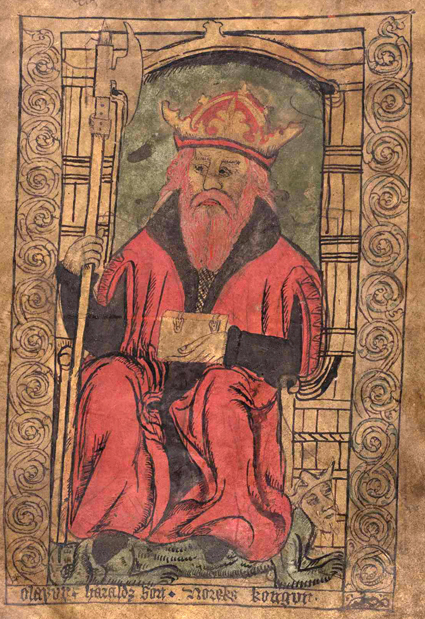 Alvin for the manuscripts owned by Lund University Library. E-manuskripter (DET KGL. BIBLIOTEK) for the manuscripts owned by the Royal Library, Copenhagen. The diagrams illuminating the hierarchy as well as the anatomy of the initials are by Friederike Richter, based on the images of the aforementioned repositories of the respective collections. First published 12 April 2016 and 15 May 2017. Last updated 28 February 2019. Webmaster.